Today is the last day of my Blogiversary celebration. I want to thank all of my readers for the support the last 5 years and hope we get to celebrate another 5 together! 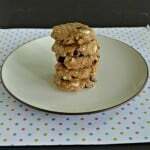 Today I’m sharing a wonderful no bake recipe that is perfect for this August heat. 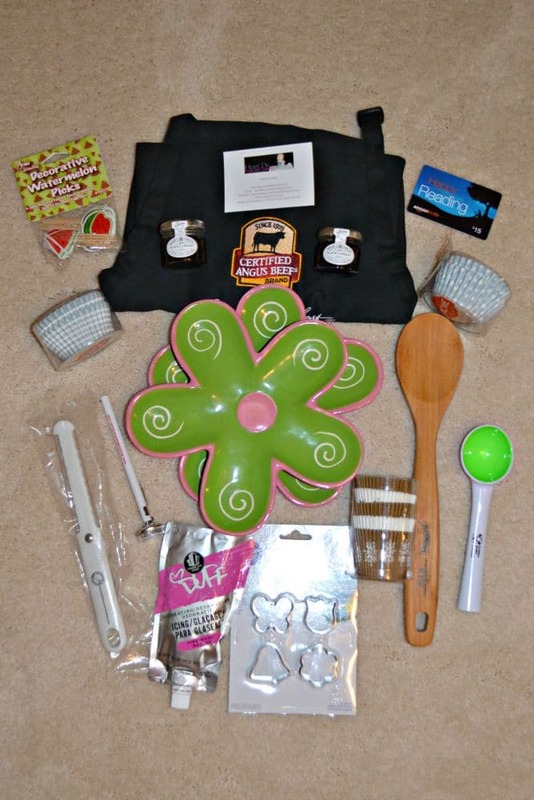 I’m also giving away some of my favorite cooking and baking tools so check out the end of this post for details! This past week it has been in the upper 80’s every day with a heat index of around 100. While I love summer, the sunshine, and the heat, 100 degrees is a little too warm even for me. We’ve had all of the fans cranked up in the house and we haven’t been turning on the oven. We’ve had a lot of meals on the grill and a few on the stove top. The one thing I’ve been missing the most is dessert. I’m usually in the kitchen 2 or 3 nights a week baking but it’s just been too hot. Since I had a craving for something sweet I began searching for recipes that didn’t require me to turn on the oven. I looked at things like pudding and mousse but all I really wanted was a cookie. 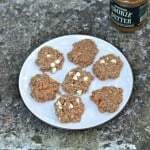 I figured the next best thing was a no bake cookie though most of the ones I’ve seen have peanut butter in them which is a no no for me. 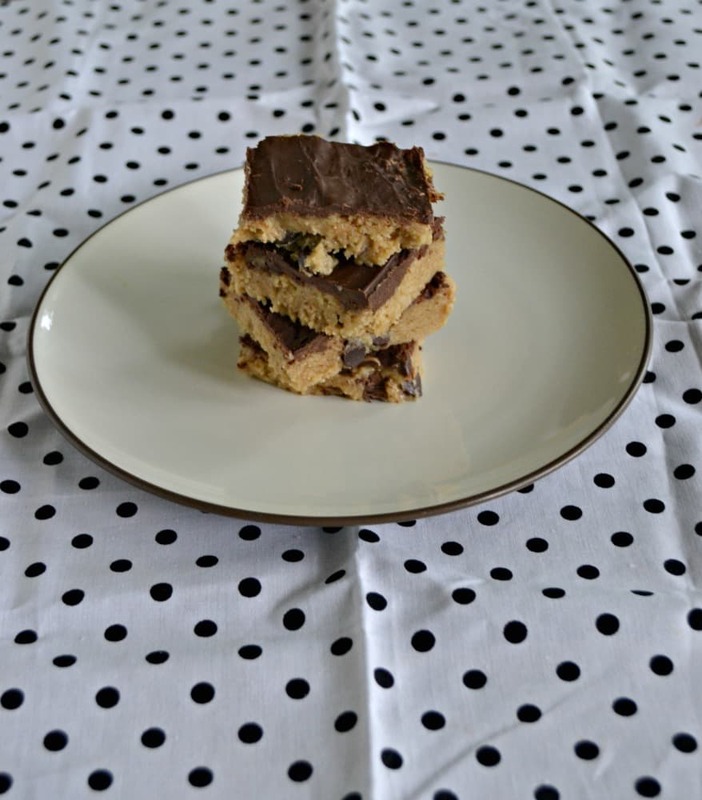 I found an awesome looking recipe for no bake chocolate chip cookie dough bars. They looked so good but I was afraid the dough would melt in the heat. I knew that the bars were frozen for a few hours before they were cut and I figured I could always keep the bars in the refrigerator if they were melting too much out of it. 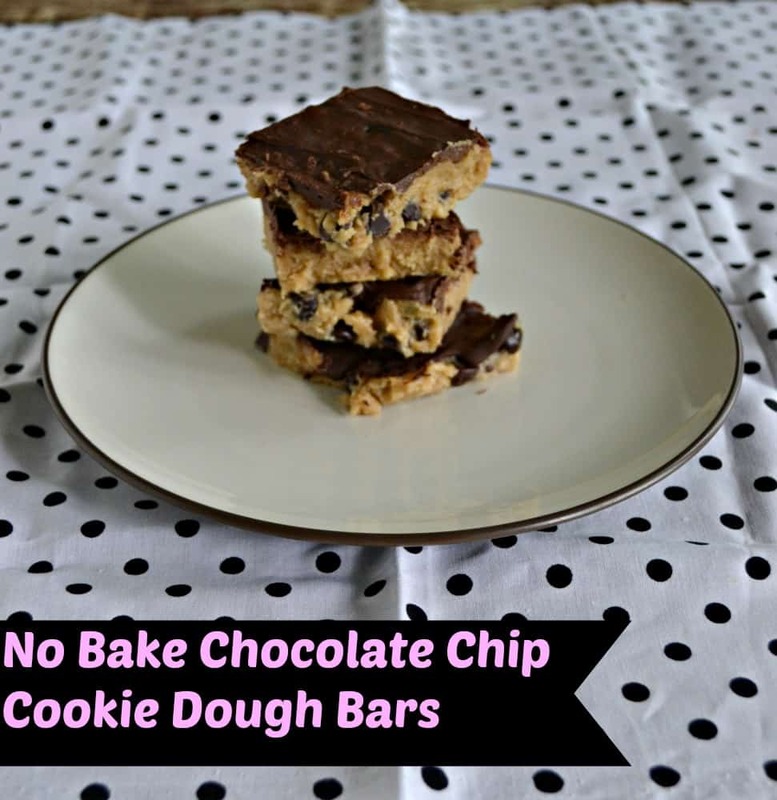 The basic recipe is similiar to cookie dough except there is sweetened condensed milk in it. Sweetened condensed milk is used in a lot of dessert recipes. Would you believe that I didn’t have a single can in the house? I couldn’t but it turned out I didn’t have any so I had to go out and get one. Thankfully it was totally worth it. This recipe is easy. All it takes is making a basic dough, refrigerating it, and then pouring chocolate over top of it. Then the entire thing is refrigerated again until it’s ready to be cut. I had an easy time cutting the bars but like I thought, after about 20 minutes the cookie dough started melting. I ended up putting them in the refrigerator and just pulling them out one at a time to eat. They tasted just like chocolate covered cookie dough which was awesome. 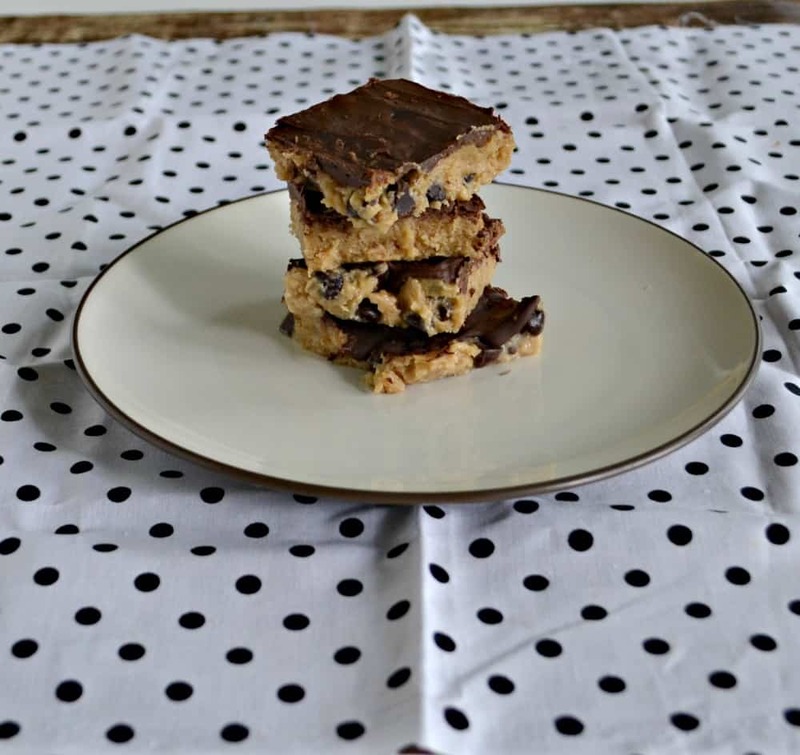 These chocolate chip cookie bars are made like a traditional cookie dough but without the eggs. 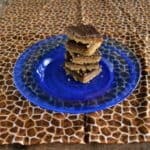 Then they are topped with chocolate and cut into bars. In a large bowl cream the butter and sugar. Add in the vanilla and mix well. Stir in the flour and mix until combined. Add in the sweetened condensed milk and cookie butter and stir until everything is mixed. Fold in the chocolate chips. 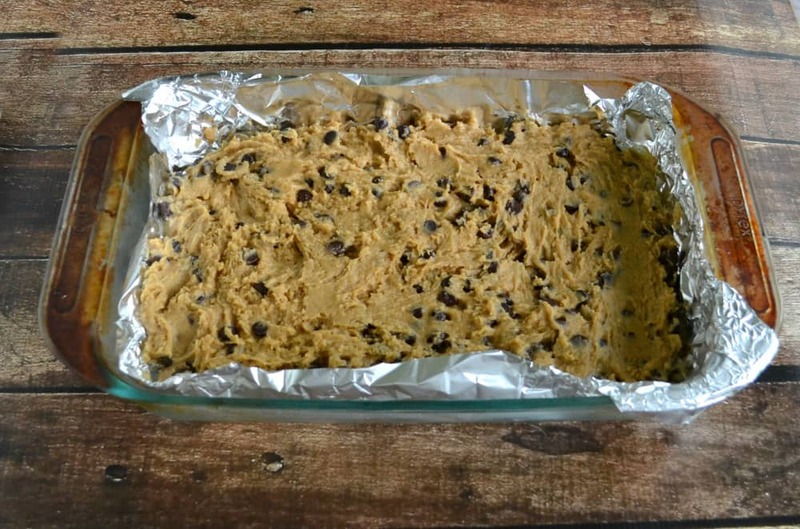 Place a piece of parchment paper in a 9 x 13 pan. Pour the batter into the pan and spread it to the edges. Refrigerate for 2 hours. Heat the chocolate chips and cookie butter in a microwave safe container in 30 second intervals, stirring after each heating. Pour over top of the cold cookie dough, spreading quickly over the top. Refrigerate for at least an hour. Cut into small bars and serve. My favorite dessert is sweet and salty like a pretzel strawberry cheesecake. I love chocolate mousse torte. I love cookbooks and humor. My favorite dessert and biggest temptation is ice cream. …and I love a good mystery. Looks like my comment on the ipad didn’t go through so I’ll try again here – thanks for hosting the giveaway! It looks like so much fun! My favorite dessert would be impossible to choose, but I made the Cook’s Illustrated coffee cake (Sour Cream Coffee Cake with Brown Sugar-Pecan Streusel) this morning and it was fluffy and very delicious with a wonderful struesel topping. I also made Cook’s Country’s Pecan Sour Cream Coffee Cake to compare side by side, and they were both winners 🙂 It has toasted tiny bits of pecans in the batter so that made the cake very good, and next time I’ll add a streusel. These bars sound PERFECT for this hot weather! Have you tried the Cook’s Country magic ice cream recipes? My husband loves the chocolate one; I haven’t made strawberry or vanilla yet, but I thought of you because it’s easy to make, super cool, and you don’t need an ice-cream maker. Or maybe you have one? I love anything from ATK or Cook’s Country-they have the best recipes and I love watching them on TV. I have not tried the magic ice cream recipe but now I’m going to have too! I do not have an ice cream maker and love making no churn ice cream recipes. Instead of a double boiler, we kept things simple for our Easy Chocolate Ice Cream and used the microwave to melt the chocolate and combine the ingredients. We used sweetened condensed milk in place of cream because it maintains its velvety texture in the freezer. For a fluffy, light texture similar to churned ice cream, we took a cue from the Italian dessert semifreddo and folded in whipped cream. Bittersweet chocolate also worked well in maintaining the texture. To heighten chocolate flavor even more, we turned to instant coffee powder. The note of bitterness intensified the chocolate without making it taste like a cup of coffee. It also helped balance the sweetness of the condensed milk. If you plan to store the ice cream for more than a few days, place plastic wrap directly on its surface before freezing. 1. MELT CHOCOLATE BASE Combine coffee (or espresso) powder and hot water in small bowl. Let stand until coffee dissolves, about 5 minutes. Microwave chocolate, sweetened condensed milk, and coffee mixture in bowl, stirring every 10 seconds, until chocolate is melted, about 1 minute. Stir in vanilla and salt. Let cool. 2. MIX AND FREEZE With electric mixer on medium-high speed, whip cream to soft peaks, about 2 minutes. Whisk one-third of whipped cream into chocolate mixture. Fold remaining whipped cream into chocolate mixture until incorporated. Freeze in airtight container until firm, at least 6 hours or up to 2 weeks. Serve. Follow these steps for chocolate ice cream that’s incredibly easy—and delicious. 1. Skip the double boiler. Start by microwaving the chocolate, coffee, and condensed milk until the chocolate is melted. 2. Skip the ice cream machine. For fluffy texture that mimics churned ice cream, gently fold in whipped cream. 3. Skip the stirring. Simply pour the mixture into a container and freeze for at least six hours. Shop carefully: White chocolate varies greatly in quality. We like Guittard Choc-O-Lait Chips or Ghirardelli Classic White Chips. If you use a bar instead of chips, chop it fine before melting it in step 1. If you plan to store ice cream for more than a few days, place plastic wrap directly on its surface before you freeze it. 1. MAKE BASE Microwave sweetened condensed milk and white chocolate in large bowl until chocolate melts, stirring halfway, about 30 seconds. Let cool. Stir in vanilla, salt, and sour cream. 2. WHIP CREAM With electric mixer on medium-high speed, whip heavy cream to soft peaks, about 2 minutes. Whisk one-third of whipped cream into white chocolate mixture. Fold remaining whipped cream into white chocolate mixture until incorporated. 3. FREEZE Place in airtight container and freeze until firm, at least 6 hours or up to 2 weeks. Serve. sweetened condensed milk for creamy texture. Adds air, no churning required. In the past, we nailed a machine-free method for homemade vanilla and chocolate ice creams using a base of sweetened condensed milk, melted chocolate chips (white or semisweet), and whipped cream. Could we complete the Neapolitan trifecta with a strawberry version? The moisture-rich berries provided more of an icy challenge than we’d imagined, but a small amount of vodka kept the crystals at bay and let the fresh berry flavor shine. You can use 6 ounces of thawed, frozen berries in place of fresh ones and bar white chocolate in place of the chips—chop it finely before melting it. If you plan to store the ice cream for more than a few days, place plastic wrap directly on its surface. 1. Process strawberries in food processor until smooth, about 30 seconds (puree should measure about ¾ cup). Microwave sweetened condensed milk, white chocolate chips, and vodka in large bowl until chocolate melts, about 1 minute, whisking halfway through cooking. Whisk in strawberry puree, vanilla, and salt. 2. Using stand mixer fitted with whisk, whip cream on medium-low speed until foamy, about 1 minute. Increase speed to high and whip until soft peaks form, 1 to 3 minutes. Whisk one-third of whipped cream into strawberry mixture, then gently fold in remaining whipped cream, 1 scoop at a time, until combined. Freeze in airtight container until firm, 6 hours or up to 2 weeks. Serve. We’ve taken our recipe for Magic Vanilla Ice Cream and introduced a fudgy swirl. Using a modified chocolate ganache made with bittersweet chocolate, we achieved the right balance of rich chocolate and creamy vanilla, where the dark chocolate balances the sweetness of the ice cream. Be sure to fold the remaining two thirds of the whipped cream into the ice cream base carefully to keep the final product light and creamy. When incorporating the chocolate, take care to swirl it just enough to disperse it without mixing it into the ice cream. Mix the chocolate only enough to swirl it; don’t mix it in completely. 1. FOR THE ICE CREAM: Microwave condensed milk and white chocolate chips in large bowl until chips soften, 60 to 75 seconds, stirring halfway through. Remove from microwave and stir mixture thoroughly, until white chocolate chips are melted and fully incorporated, about 2 minutes, pressing chips against side of bowl as necessary to melt fully. Stir in sour cream, vanilla, and salt. 2. Using stand mixer fitted with whisk, whip cream on medium-low until foamy, about 1 minute. Increase speed to high and whip until soft peaks form, 1 to 3 minutes. Stir one-third of whipped cream into white chocolate mixture until combined. Fold remaining whipped cream into white chocolate mixture until just incorporated. Pour ice cream base into freezable container. 3. FOR THE CHOCOLATE SWIRL: Lace chocolate in 2-cup liquid measuring cup. Heat cream, corn syrup, oil, and salt in small saucepan over medium heat until mixture is steaming, about 3 minutes, stirring constantly to avoid scorching. Remove from heat and immediately pour over chocolate. Allow mixture to sit for 5 minutes, then stir until chocolate is melted and smooth. 4. Slowly pour chocolate mixture into center of ice cream base. Dip butter knife through chocolate to bottom of container and lift up, swirling as you lift. Repeat about 10 times, until chocolate is evenly swirled through ice cream base, being careful not to overmix. Cover and freeze until firm, at least 6 hours or up to 2 weeks. Serve. Pour the warm chocolate mixture into the center of the ice cream base. Dip a butter knife through it to the bottom of the container and then pull up while stirring until the swirl is evenly dispersed. I think German Chocolate Cake is the one dessert I will always choose. I love mysteries and biographies. My very favorite dessert is Key Lime pie! I love the decadent flavors and crunchy crust and YUMYUMYUM! What a treat! I have a really hard time picking a favorite genre. I love those books about after the world ended, or the future after demise, dysintopic fiction? Something along those lines . . . they’re very popular right now, and I love seeing those and spending time reading those! My favorite dessert is English Trifle, my Mom makes it for me on my birthday. I love books based on true life stories, one of my favorites was about a couple who homesteaded in Alaska. I like brownies that have some type of additional add in. For example caramel and peanut butter are my favorites. My fav desert is Chocolate Chip cookie dough. I love to read mystery, thriller, and true crime books. I like to bake scones and cookies and have those for dessert… but I always have dessert before dinner! My favorite types of books to read are thrillers. Stephen King is my favorite author! I love cheesecake and ice cream. Sugar is my weakness. I like to read thrillers and any type of book really. Thanks for the chance! My favorite dessert is gelato! I love to read thrillers! My favorite dessert is white chocolate raspberry cheesecake. I love paranormal romances the most. My favorite dessert is strawberry shortcake. I love no bake cookies. My favorite genre of books is Historical Non-Fiction. My favorite dessert is chocolate chip cookies! My favorite genre of books is fiction/literature! My favorite dessert is a Seven Layer Bar. Omg they are to die for! I like YA novels like Hunger Games. I am a sucker for romantic/love stories and mystery. My favorite books are nonfiction biographies. My favorite books are sci-fi! Anything decadently chocolate, Creme Brulee with fresh Berrie and, Blueberry Pie! My favorite dessert is cheesecake. Short Stories, poetry, (thoughtful) fiction, political/social commentary ~ I love to read. My favorite dessert lately is sorbet, but in the winter its carrot cake. i like mystery books and chocolalte cake! My favorite dessert is cheesecake, any kind I love them all!!!! My favorite books are horror. My favorite dessert is chocolate mousse. I like fiction of all kinds, mysteries best. I favorite desserts are pies, whether it be pecan, cherry, blueberry, I love pies. I love who dunnits like murder mysteries. One of my favorite desserts is Cheesecake! I really love the historical romances! Cookies are my favorite dessert. My favorite book genre is mysteries. My favorite books are thriller/mysteries, thanks! My favorite dessert is brownies, still warm from the oven!! Hmm…It’s spice cake with caramel icing! One of my favorite desserts is fresh strawberry pie with real whipped cream on top. My favorite book genre is romance. an apple dessert that my aunt makes is my favorite. its pure heaven! My favorite dessert is dulce de leche cake. I usually lean towards science fiction books. Super tangy Key Lime Pie! My favorite genre is probably instructional, like training or DIY. My favorite dessert is my mom’s famous Frozen Margarita Pie! Favorite book genre is murder mystery. Love trying to solve it on my own! I love cheesecake. Its thick and creamy and just oh so yummy! I will ready any type of book that catches my attention. Mary Higgins Clark and Nicholas Sparks are my favorites though. My favorite kind of books are funny autobiographies. I simply love baking, frosting, and decorating cupcakes for people. Whether it’s a holiday, a get together or function. or just because. Caramel cheesecake is my favorite dessert! I think my favorite genre of books is a tie between humor and a good mystery, a good mysterious humor book or vice versa would be excellent! My favorite dessert is frozen mocha cheesecake! I love Key Lime Pie. I love paranormal books, paranormal romance even more! I love to read science fiction. My favorite desert is vanilla ice cream with any kind of fresh fruit! i’m a sucker for my dad’s homemade blueberry cheesecake! My favorite desert is chocolate chip cookies. This looks soooo good! My favorite dessert is probably cheesecake, though chocolate chip cookies and brownies are a close 2nd! or 3rd…. I read all of the time! It is hard to pick a favorite genre, but right now I’m into historical romance. I go through spells lol. 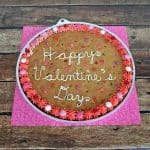 My favorite desserts are cheesecake, chocolate mousse, and pumpkin chocolate chip cookies. My favorite books are trivia and fact books. I love learning new information! Blueberry Pie and Horror Books! I absolutely love cheesecake. I love all flavors. My favorite books are mysteries. I did also enjoy the Harry Potter books that my daughter was reading. I like to read what she is reading so we can discuss them. I love cheesecake. Yum! kristiedonelson(at)gmail(dot)com Thank you. I love inspirational fiction – especially Amish fiction. kristiedonelson(at)gmail(dot)com Thank you. I am kind of corny but my favorite books are romance novels. My favorite dessert is anything with ice cream! My favorite kind of books is memoirs. No dessert for me … but I would enjoy a few chucks of pineapple and melons. As for books … ancient history … Greeks, Phoenicians, Assyrians … but mainy sticking with academic journals. My favorite genre of books is true crime.